Since the autumn of 2007, the British Canoe Union (BCU) have been bringing in a new coaching system which they hope to improve the experience of paddlers coming in to the sport by increasing the standard of coaching across the sport. The new awards offer national accreditation by the BCU, the UKCC (UK Coaching Certificate), and the National Qualifications Framework. 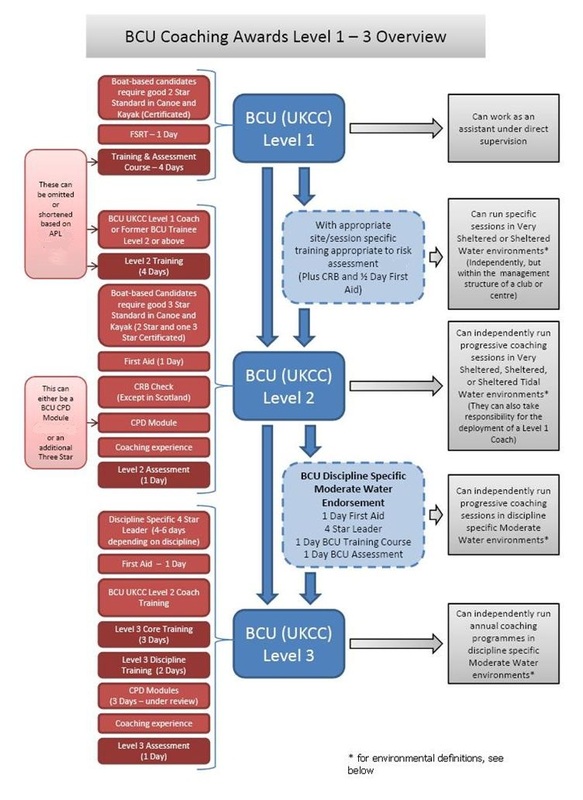 The diagram below shows each of the new BCU UKCC levels, the pre-requisites required and the remit they give. This diagram does not show how coaches with old scheme qualifications fit in to the new scheme or how the new awards compare to the old ones. Canoe Wales (a division of the BCU) has developed a good webpage outlining progression options for all old scheme coaches. * BCU Environmental Definitions can be viewed here. The BCU is committed to ensuring that coaches are able to continue their development and improve their knowledge in specific areas whenever they see the need. Foundation Modules and Discipline Support modules can be attended by anyone at any time in their coaching career. BCU UKCC Level 2 trainees must attend one foundation module prior to their assessment (holding a 3 star in both a single-bladed and a double-bladed discipline would also fulfil this requirement). Refer to the BCU Coaching Support Modules webpage for more information. The BCU recognises that in some instances aspirant coaches will have prior experience that may enable them to enter the Coaching Awards programme at a higher level. If you feel you have experience that can be accredited as prior experience refer to the APL webpage for more information. Refer to the Coach Update webpage for more information.